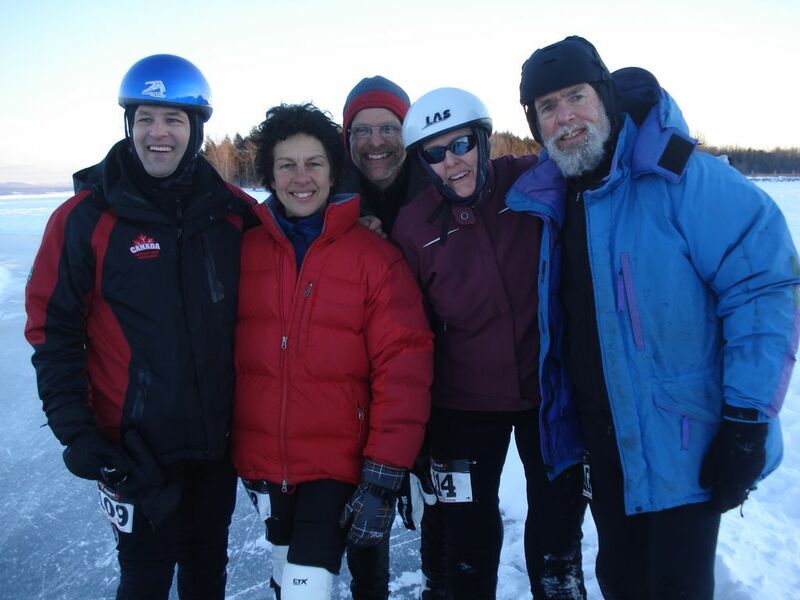 This past weekend saw the Skate the Lake Event celebrate its 10th anniversary and the SLSSC joined in on the celebration with a total of 15 club members participating in various races over the two days. The Event was also given the right to hold the North American Marathon Championships. The ice conditions were the best ever experienced in the history of the event, however, this was balanced off with extreme windy conditions on Saturday. Although much colder on Sunday there was no wind and the sun shone for throughout most of the day’s racing. Unfortunately for the event, many pre-registered would be participants did not arrive as a result of the poor and often dangerous driving conditions. At least six of the regulars from Waterloo had to turn back due to the road hazards. However, those who attended enjoyed the two days and smiles were all around. Jake Maarse of North Gower and Catherine Kwiecien of Waterloo won the overall men and women’s categories for the North American championships which are based on combined results of the 25 and 50km races. SLSSC did extremely well, medaling in many events, gender and age categories. Complete results will be posted on the Marathon skating website. Click on the Gallery picture for a larger version. SLSSC participants in the 25 km on Saturday. 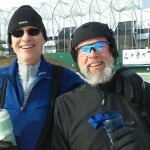 John B., John A. and Heidi (not in photo) competed in the 50km on Sunday as well. 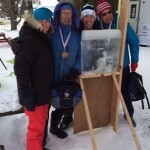 Tonya (Ottawa), John, Marco (Portland), and Jake (North Gower) with the thickest slice of Big Rideau ice in the history of the event. Two skaters missing from the photos are Emma Grace and Chloe Segal who competed in the 5km on Sunday and who came in first (Chloe) and second (Emma Grace) overall. 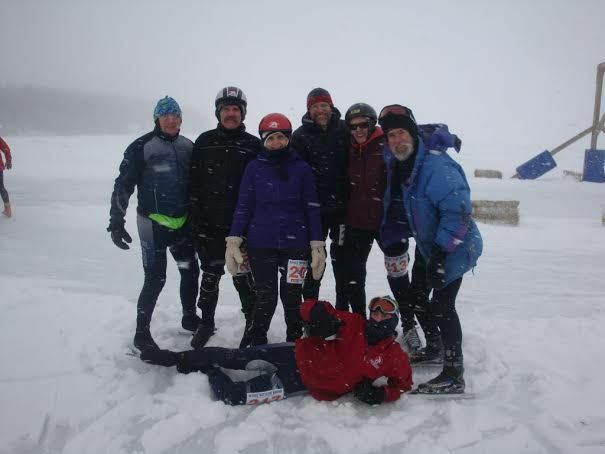 Five club members managed to find their way down to North Hero Vermont last weekend to participate in the first annual Lake Champlain Marathon. In spite of the perfect storm we all managed to arrive at different times but in time to reach the starting line for the 21 km event on Saturday. An early start of 10 am was delayed until mid-afternoon to give the Waterloo ladies time to negotiate bad road conditions. They arrived with 15 minutes to spare! Todd, Heidi, John A., John B. and Fimke all performed well with Todd putting in the best time with a fourth place overall in a field of 27. The 42 km on Sunday was held under absolutely perfect conditions with sunny skies and no wind. Heidi, John A. and Todd partook in this event and again Todd showed his skating strength and stamina by placing 6th overall in a field of 24. We all agreed that this was a wonderful weekend at a superb venue. Most of us stayed at the very comfortable North Hero Lodge where lodging, food and draft beer were all first class. We all agree that this is the venue to head for next year. We must thank the various folks in North Hero who made this event possible. It was their first time and to put on such an event but they handled the steep learning curve admirably. Marathon skating now moves out west with the Silver Skate Marathon in Edmonton on family day weekend and the Sylvan Lake (near Red Deer) being held the following weekend over three days. Anyone interested in joining me at Sylvan Lake for three races of 25, 50 and 100 km? 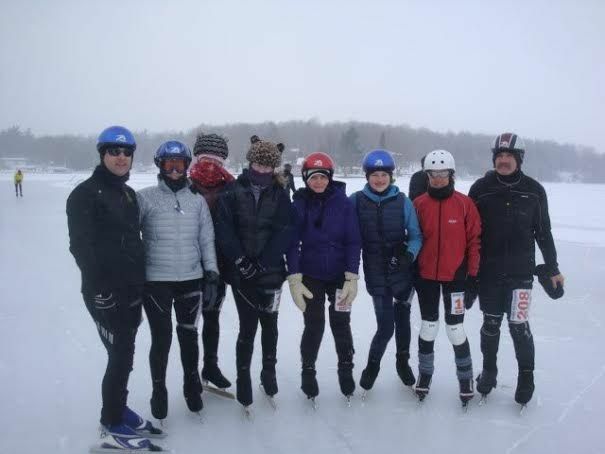 On Saturday January 26th Portland Outdoors held its 9th annual Skate the Lake event under perfect conditions. Due to very cooperative weather conditions and the dedicated event volunteers the ice conditions were the best ever for this event. Cracks were many but small and easily detected and the ice surface was as smooth as any Zambonied surface can be. A number of skating events were provided to meet the needs and abilities of the large number of skaters who attended the event. SLSSC was overwhelmingly represented by 15 of our members comprised of 12 masters skaters and three of our competitive skaters. We had eight skaters in the field of 26 in the 10km event and they took away four gold medals in various age categories. Seven of our skaters competed in the 25km , producing a further three medals: one each of gold, silver and bronze. 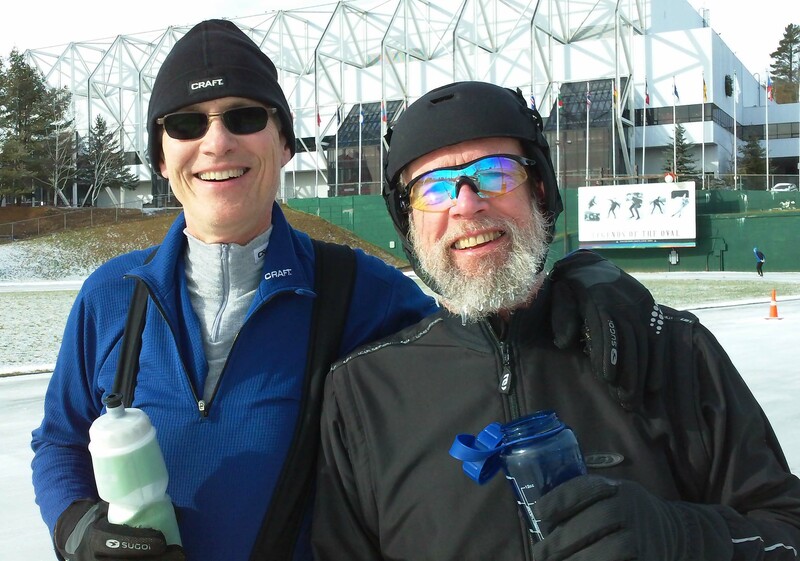 Two skaters took on the grueling 50km and produced a bronze and a gold. Following a cold week with good skating conditions the Brewer oval came under the influence of warmer weather on the weekend that resulted in challenging skating on the Saturday afternoon and a wicked challenge for Sunday with extremely high winds. Of the 24 entries for the 21km, four were from our club (Connor, Kyle, Heidi and John). Connor and Kyle placed 12th and 15th respectively. John and Connor used the 4km race as a warmup for the 21 and both John and Heidi turned in good performances for the 21km event. 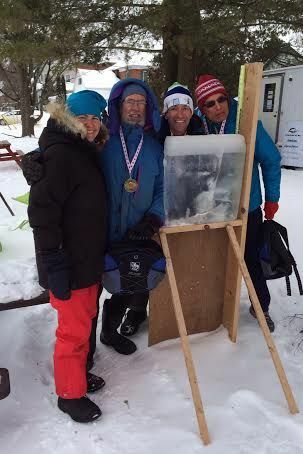 On Sunday the 42km was modified to a one hour blizzard challenge as a result of winds up to 90km/hr. At one point during the race our lightest skater (Connor) was blown backwards! However he still managed, along with Kyle, to clock 61 laps while John knocked off four fewer (John prefaced this race with the 10km which was held one hour before the 1 hour challenge). Heidi chose short track in Kingston on Sunday. 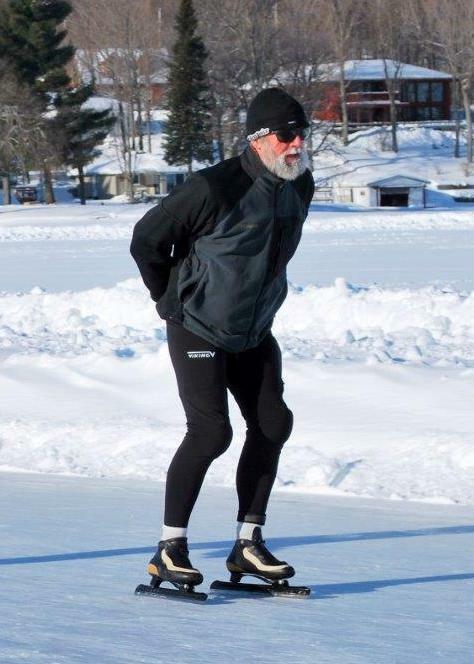 Long distance skating is now becoming popular within the club and we have seven members, including four masters and three competitive group skaters, who have now participated in the half and full marathon MSI (marathon skating international) events. 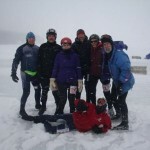 The next event is Saturday Jan.26 with the ever popular Skate the Lake at Portland on Big Rideau Lake and several of our members will be taking part in this event. The last event in the east will be the inaugural Lake Champlain marathon Feb 8,9 in Vermont. At least five of us are planning to attend this ‘probably loaded with fun’ event. It is never too late to sign up for either of these two events but if you just want to experience the event atmosphere you are encouraged to attend the Skate the Lake event as a spectator. For pictures of the Ottawa marathon weekend go to the MSI website and look for the event description and Alicia’s pics.